Successfully designing an operating room or a surgical suite layout requires maximizing space with strategic placement and proper flow to ensure efficiency and safety. It is of paramount importance that careful consideration is made to the OR setup, the patient's positioning on the operating table, and the traffic flow. Poor planning and improper positioning (equipment, patient, instrument) may jeopardize the safety of the operation or lengthen its time. 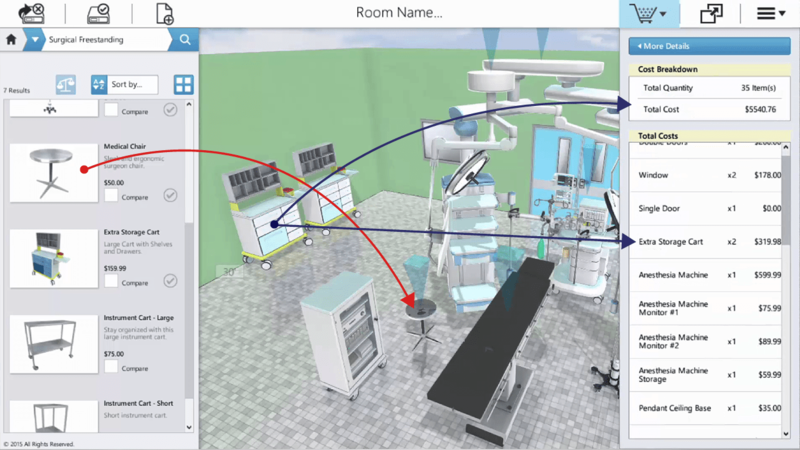 Axonom has developed a 3D Floor Space Planning platform to provide designers with a single solution to interactively and visually design the operating room, quote and order medical products, and save the 3D model design. Not all ORs serve the same purpose (Orthopedic/Urology/Cardiothoracic), utilize the same equipment (tables/storage cabinets/lights) or have the same dimensions. Ordering products and designing the room without seeing the products in place is not practical. Planners and designers can leverage design standards for repeatable stock spaces but will need the ability to customize to accommodate the exceptions. Powertrak CPQ brings the OR to life by empowering designers to visually build and design operating rooms using 3D models, and order medical products, instruments, and other equipment at the same time. When the design is complete, Powertrak enables users and key stakeholders to experience the designed environment through virtual reality. Drag an item from the product palette and drop it into the 3D room rendering. Place the item into the appropriate location. Don't worry if you don't like the initial location. Select the item and reposition it to your liking - at any time. Powertrak offers collision detection to prevent two items inhabiting the same space. Some products have multi-positional points. Watch how these products fit together, move, spin, and rotate. Collision detection can be turned off. All items can be rotated to best reflect the final layout. Send the rendering to a manager. Re-use an old design and modify it for a new project. See how many products order, roll up of total cost, and an individual per item cost. All items placed into the visual rendering have a cost. Apply discounts to certain products, bundles, price points, or repeatable customers. Save a quote and/or submit an order. If you are interested virtual reality experience of an OR suite, please watch our prerecorded VR configurator demo on our website or request a Powertrak demonstration.